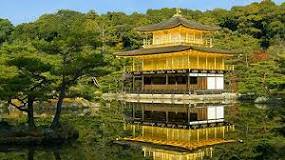 Kinkaku-ji, officially named Rokuon-ji, is a Zen Buddhist temple in Kyoto, Japan. Kiyomizu-dera, officially Otowa-san Kiyomizu-dera is an independent Buddhist temple in eastern Kyoto. The temple is part of the Historic Monuments of Ancient Kyoto UNESCO World Heritage site. Nijō Castle is a flatland castle in Kyoto, Japan. The castle consists of two concentric rings of fortifications, the Ninomaru Palace, the ruins of the Honmaru Palace, various support buildings and several gardens.